How to choose the best Body Analyzer Scale? Who needs smart body composition analyzer scales? The term smart gadget is an irrevocable part of our life now. These high tech devices touched practically all spheres of life. They really help and their functions are impressive. Surely, there are a few people who have never heard about the smart scale to measure weight and body fat. They also have the other names like diagnostic scale, BMI scale or body composition scale. In fact, names are different but the mission is equal. They monitor the body composition for your health benefit and control the right weight. We decided to present to you the best body analyzer scales to track the weight loss. Year by year home scales became more and more popular. Nowadays this equipment engaged fitness industry giants. So, Fitbit, Withings, Omron, iHealth and others polish their manufacturing skills. High competition affects product quality and consumer ratings. There is a lot of information about their types, brands, and features. However, our goal is to detail the scales which are totally improved by the customers in practice. QardioBase2 WiFi Smart Scale and Body Analyzer: monitor weight, BMI and body composition, easily store, track and share data. Free app for iOS, Android, Kindle. Works with Apple Health. Company Withings was one of the first company which began smart scales production. Recently they’ve joined with Nokia. So, the experience and quality from both sides generate the range of great fitness devices. The scale Body+ is the smart health analyzer to track weight loss and not only. The manufacturer notes that 65% of Withings smart scales users lost their weight during the first half a year. The metal and plastic are the materials for this durable device. The maximum weight limits up to 180 kg. This model Body+ determines the weight accurately. Additionally, you can track the content of water and fat, the muscles and bones mass. In addition, you will know the required calories amount. In seconds Wi-Fi or Bluetooth sent the information to the Health Mate app. Besides, Wi-Fi connection provides a daily local weather forecast. Surely, it helps you to plan your day. Certainly, Nokia Body Plus is suitable for all the family. They are able to “recognize” up to 8 users. Each one has its own profile with independent access. There is a battery charge indicator. Usually, they can power the scale up to 18 months. Syncs with: Apple Watch, Apple Health, Fitbit, Google Fit and other health and fitness apps. The manufacturer offers the one more smart weight and composition controller Body Cardio. This model from Withings-Nokia brand is able to monitor the heart rate. It’s no need to represent the advantages of fitness smart things from the company Fitbit. High tech and health cooperation from Fitbit Aria offers the new generation of scales. It’s much more than just amazon kitchen scale or a bathroom scale. Electronic scales Fitbit Aria Wi-Fi Smart Scale Black is a stylish design, excellent functionality, and high technology. The device will measure and analyze the weight in kg and pounds. The maximum workable weight is 158 kg. It also informs the body mass index (BMI), fat percentage, muscles mass. Thus the item can store private results of max 8 people. It’s cool, that every user can enter the personal password to keep the body data in secret. They automatically sync to the cell phone. Then you can track all changes over the installed applications. Moreover, the user can choose the way to render the data. It can be either digitals or visual graphics. Besides, you can coordinate this smart scale with your Fitbit fitness tracker. There is no need in charging cord anymore. Four batteries provide regular 18 months work. The device is safe for humidity rooms. But, it’s better to prevent too much water on the scale. With this in mind dry the feet carefully before you step on the glass surface. Certainly, you’ll get an amazing and elegant fitness accessory to the interior. The manufacturer presents a Fitbit Aria Wi-Fi Smart Scale. See the comparison chart: Fitbit Aria vs. Fitbit Aria 2. Besides, meet the other smart members of the Fitbit family. Surely they will help to be in a healthy trend. Japanese company Tanita has 70 years of history. More than 55 years they deal with the production of high-precision weights. Today their assortment includes the goods that help users monitor their health. They became a world leader in the production of high-precision electronic scales. The company’s success is the result of excellent technology, unique design, and high production standards. Thus, in 1992 Tanita introduced the world’s first integrated body composition analyzer on the markets. In 1994 they also were the first who add body fat monitoring function to the smart scales. Tanita’s accuracy, innovation, and reliability have got worldwide trust. What information can Tanita body diagnostic device tell? It can measure your weight in kg, pounds, and stones. You can find out the percentage of fat and water in your body and visceral fat. The user will be able to know muscle and bone mass. The unit will recognize the biological age from 12 to 90 years. Also, these scales will tell your daily calories limit. In fact, it depends on the level of metabolism. The body analyzer splits BMI or body mass index for children from 5 to 17 years old and adults from 18 to 90 years old. Besides, the users receive 19 vital measures separately on the legs, arms, and body. There is a memory card to store the data for 6 months. The results are the base for the graph. A perfect design will bring pleasure. It’s no need to look down for the results. The monitor is in the handle. This is more convenient. Certainly, they cannot lie. The scales tell the truth about your weight loss process. These are professional body analyzer scale of gold standard. There are cheaper and more costly models for your consideration. Is special software required to monitor the body analyzing? Omron is the other Japanese corporation known worldwide. This giant develops and manufactures electronic and automatic products for different industries. The company was founded in 1933. At present Omron Health present to the market high quality medical and fitness equipment and devices. Smart diagnostic body analyzer scales are in the list too. Surely, the knowledge of correct body composition helps to achieve fitness goals. So the model HBF-514C provides complete body features monitoring. To get more accuracy this Omron’s scale uses feet and hands modes to obtain the information. Six sensitive detectors scan and show 7 physical values. They include the weight, fat percentage, visceral fat, and body mass index or BMI. Besides, it shows the skeletal muscle and metabolism in rest. On the base of these indicators, you will learn the body age. It’s easy to use this health monitor. Firstly, switch on the power. Then select your personal profile number and step on the platform. The memory function stores the data of four personal profiles. Accordingly, the user can control 1 day, 7 days, 30 days or 90 days results. Moreover, people can check the highest and the lowest readings for each type of measurement. There is a cord connecting the platform and handle to the easy to read display. So, the person’s height limit is 6.6 feet. This scale does not link to USB, WiFi or Bluetooth. It means that you miss the hard copy report. Hopefully, the other health care products from Omron will be interesting too. The best seller among blood pressure and heart rate monitors on Amazon is Omron’s product. Omron 10 Series Wireless Bluetooth Upper Arm Blood Pressure Monitor. Beurer’s health technology is high-quality German products for your well-being, comfort, and beauty. They develop and produce precise floor and kitchen scales, multifunctional massagers and others. All products are designed to save and improve health, maintain the fit for excellent well-being. and attractive appearance. Reliable devices with an ergonomic, attractive design are really convenient and easy to use. For a healthy lifestyle, followers the company has developed a series of diagnostic weights. They allow you to analyze the body physical condition. So, the results help to develop a proper program of nutrition and exercising. These scales work on the principle of bioelectric resistance. In other words, it is bioelectric impedance analysis or BIA. In a few seconds, they determine the body fat and water percentage, bone mass. Besides, you can always control your weight. It is enough to set the gender, age, height and degree of physical activity. The rest index smart scale will do. The largest weight is 400 pounds. There is an overloading indicator. You can simply interchange between kg, pounds, stones. The accuracy interval is 0.2 pounds. Ten users can monitor 5 activity levels. The device keeps the information. Blue backlight helps to see the results in dark. Some models calculate the body mass index. As well they track the level of the main and active metabolism. 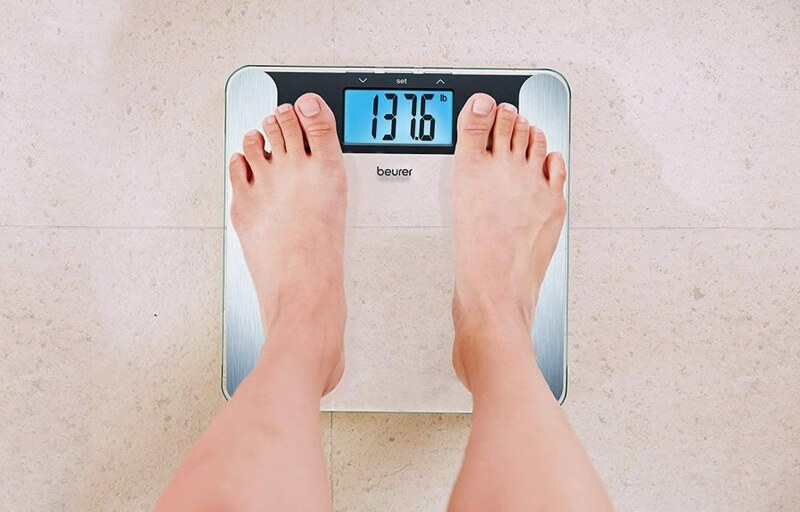 Beurer weighting diagnostic devices help the users to reach their goals. So, you are able to reduce fat mass, make the bones stronger and maintain water balance. These innovative diagnostic scales are able to store the information in a smartphone. It’s true, they are created to take care of you. All Beurer goods maintain the current health trend and help you and your loved ones stay healthy. Besides, they will bring real comfort to the home. Can I sync the weight and other information with any of the fitness apps? Unfortunately, no it can not. Beurer BF220 Body Fat Analyzer Scale will work with Beurer HealthCoach application only. The Yunmai Premium Smart Scale Black (M1301-BK) successfully combines stylish elegant design and smart potentials. So, the device has a set of many functions. The company Yunmai used leading technologies in the production of Premium Smart Scales. Accordingly, it’s possible to know the weight up to 400 pounds or 180 kg. The scale is rather accurate, with a minimum error of 100. Moreover, the device also calculates 10 vital indexes. The owners will know the body mass index, the body fat and water levels, visceral fat, bone, and lean mass. It also determines the body age and the basal level of metabolism. In addition, Yunmai Premium Smart scales can store data about 16 users. You do not depend on the WiFi connection. Firstly, load the Yunmai app and switch on the Bluetooth and step on the weight to begin the healthy weight loss tracing history. This application from Yunmai cooperates with Apple Health, Fitbit and Google Fit. As the other producers Yunmai uses well known bioelectric impedance analysis or BIA technology. It’s necessary to consult with the specialists in case you have any medical staff like a pacemaker. The pregnancy is the reason to talk with a doctor too before using this device. However, the users under 18 years old can see the weigh only. Actually, there is an option if you do not like the black color. In that case, the manufacturer offers the colorful version of smart scale body analyzer for weight loss. Select among blue, green, yellow, pink or white. In fact, the functions and quality are the same. Just make your life healthier and more bright. You will get the Colorful option of YUNMAI Smart Scale, 4 AAA batteries and User manual. “ Since I made a decision to start tracking body fat stats, I have been looking for a BIA biological resistance measurement scale for a while. I read reviews for different types, this one comes to be the most affordable and accurate one. Then I ordered it and got in 3 days. It is lightweight, looks sleek, modern and thin, has a nice glossy shine on it. I have been using it for 3 weeks. The scale comes with batteries. The app is easy to set up with a user-friendly display. I am surprised that it gives a result much quicker than gym machine and it’s accurate too! It provides data of your body weight, BMI, fat, muscle, bone, water, BMR, visceral fat, protein,, and fitness age. You don’t need for pen and paper to track data. It gives you an overall score. It supports multiple profiles, saves data for the family, you can easily create a visitor profile. The app has charts of comparisons for Day/Week/Month/Year data. Stats in the app are stored and easy to see graph displays difference over time. This helps to track your progress. iHealth Core is the product of a well-known producer of variable health and fitness goods. This is an advanced smart scales model. Firstly, polished glass makes the surface strong and brings a modern style to the design. Secondly, this body health equipment has BMI-analyzer. It helps to measure the range of human physiological parameters. By means of a weak electrical signal, it shows the main health initiatives. They are body mass index, fat, bone and muscle content, visceral fat volume, and others. On the base of the results, you get certain advice. So, you can keep proper nutrition and select foods with certain calorie content. Up to 10 people can trace their parameters. Simple and prompt WiFi connection to the iHealth MyVitals app. The user can always consult with the nutritionist, physician or coacher. Definitely, they will explain the further steps according to your body actual composition. It assists to set the right targets and choose the best way to get them. Besides of nine physical body information the tool is able to show the humidity and the temperature of the place. The delivery package includes iHealth Core Body Composition Scale, Owner’s Manual, Quick Start Guide, and 4 AAA Batteries. Please see the detailed video on how to manage the iHealth core scale in the best way. Since 2015 the company Renpho supplies the wide assortment of home, fitness and personal care products in the USA and Europe. Their pride is RENPHO Bluetooth Body Fat Scale. This is a great balance of quality and friendly price. The rate of this smart scale is confirmed by more than 7000 customers’ reviews and 1000 discussed questions. Over a million Renpho scales have found their new owners. The big advantage is measuring of13 important body parameters. The device shows and monitors the weight, BMI, fat percentage, visceral fat, hydration level, lean and bone mass, fatless weight, basal metabolism, protein, and body age. It’s great that the user can weight without the phone. The scale saves the results. Accordingly, the information will be sent to your app’s account after the next connection. Renpho gives free access to Apple Health, Google Fit и Fitbit App. Four sensors and auto calibration mode grant high precision. The interval is 0.2lb or 0.05kg. Do not use the carpets or any soft surfaces for the process. Firm and flat floors guaranty the data accuracy. The producer does not limit the users for one scale. It’s better do not overcome 396lb or 180kg person’s weight. The surface’s material is five mm tempered black glass. The buyer will always get support from the local customs service of the supplier. This body composition controller is the product approved by the FDA. Thus, this is a reliable assistant and body scale analyzer to be healthy and in fit. Can this body analyzer scale sync to with Fitbit? How is it possible to see all the measures? Are they on scale’s display? The display shows the weight only. The other body information you can track over the applications. Some wrong metrics were loaded. How to delete them? Here is the instruction, in case you need to delete any wrong entry. Are you looking for a budget but reliable body analyzer scale to track weight loss and body composition? Please, pay attention to the model Mospro Smart Body Fat Weight Scale. The manufacturer is obliged for 5 years guarantee. Available 24 hours service supports you for 365 days in case of any uncertainty. This home, body scale manages the Bioelectric Impedance Analysis – BIA technology. Four electrode plates realize a precise measuring process. The interval 0.1 kg/ or 0.2 pounds and the biggest weight is 150kg or 330 pounds. The smart unit will show up to 11 vital positions. You will know about the weight, fat content, BMI, the percentage of water, muscle and bone mass, metabolic level, protein, age, and some others. As a fact, it’s easy to trace the effect of fitness and weight loss programs. Nice design in nothing extra style. Black seven millimeters black tempered glass forms the firm platform. There are no switches or buttons. Then, the user needs to step on the scale’s surface to obtain the data. The cell phone is not required when the people weight. The Mospro device will pass it to the gadget after the connection over Bluetooth. You will never lose all the information due to the updated cloud security. Any number of users are able to register on Health, Google Fit, and Fitbit App. Definitely, their easy Feelfit app encourages you to do the best to fulfill your aims. The body fat weight scale support and control the health of the whole family. Can Feelfit app of this scale cooperate with the Fitbit tracker? Definitely, yes. The body analyzer scale over its advanced application syncs your data to the fitness tracker. Do you prefer to avoid extra angles in your home interior? The model of Quardio Base2 Body analyzer scale to track weight loss is for you. This white or black circle shaped item has a stylish and minimalistic look. The American company Qardio produces these smart scales. Maybe you’ve already heard about their smart blood pressure monitor and a chest heart monitor. Qardio QardioBase 2 Wireless Smart Scale scales can measure the weight up to 400 pounds or 180kg. In addition, they also display the percentage of body fat and water balance. The users can see bone and muscle mass, BMI too. In spite of different modes, the unit ensures reliability and ease of exploitation. It can recognize automatically many users. Also, due to a heavy, durable ABS-plastic base, they are stable on all surfaces. In addition, the built-in battery operates up to 12 months without recharging. The QardioBase 2 is equipped with four sensors. They determine the weight and other indicators in seconds. You will feel a light vibration. It is a signal that the information is fixed successfully. Their accuracy varies within hundreds of grams. The analyses of the body vital features allow seeing a complete picture of physical condition. Accordingly, the user can adjust the training program or diet. Above all, there is a special mode for future mothers. It l shows the current stage of pregnancy and illustrates the images on your smartphone. Thanks to the “Smart Feedback” mode different emoticons encourage you to go on the way to success. Qardio QardioBase 2 Wireless Smart Scale is compatible with various gadgets and applications. The QardioBase 2 scales will be your best friend who knows everything about your health, and even a little more. Does this model sync with MyFitnessPal app? Have you already got the fitness gadgets from Garmin? For instance, it could be the fitness tracker band of this brand. In that case, please pay attention to their smart weight and body composition scale. As a result, you can combine all devices into one ecosystem. Thus, the owner can follow all body data with one application. Here is Garmin index smart scale review in details. Of course, this device will be useful for everybody. These devices will help if your target is weight loss or muscle mass building. Multi-functionality of modern smart scales discovers your body composition. First of all, you can always control the weight. Also, they will define the number of vital indications. Main of them is BMI, fats, water, muscles, and bones mass, actual body age, etc. These scales with body monitoring abilities are especially important for definite groups of people. So, this equipment is crucial in medical practice. It assists to make a full person’s diagnostic. Accordingly, the physician can prescribe proper treatment. Then you can correct certain body parameters or prevent definite diseases. Present sports medicine uses these clever health and fitness supporters too. Customized correct diet and proper workout program will be based on individual results. The coaches can control your changes on distance. How to precede all the measures. There is nothing complicated in it, absolutely. Put the scales on a flat hard surface. You can get inaccurate results using the device on the carpet or any soft covers. Most modern models offer a weight range of 5-150 kg. Some units have the limit up to 180-220 kg. The intervals and accordingly error level vary between 0,05-0.1 kg. Then you do everything as with any digital weights. It is necessary to remove all outerwear, accessories, and shoes. Secondly, stand barefoot on the platform with electrodes. Ensure, that feet are dry. It’s a painless and fast procedure. The contact between the foot and the electrodes should be the closest. So serious calluses and corns could interfere with the results accuracy. The advice is to measure body composition and trace the weight at the same time of the day. Try to avoid the lack of water in the body. If you wish to track your weight loss and other parameters synchronize the scale unit to your cell phone. Depending on the model different applications are available. As a rule, most of the smart weight and fat body analyzers coordinate with Apple Health, Google Fit, and Fitbit App. Either WiFi or Bluetooth connection is required. You can always follow the user manual or apply for service support. Constantly hold the BMI, fat and body analyzer in a dry place all the time. Take the device far from magnetic fields. And you will be sure in precise indications. It will also prevent the possible scale’s damage. Special caution for pregnant. Check if the body analyzer equipped by mode for future mums and their babies. This is a notion for the people who have a pacemaker, knee implants or any other internal devices. They have to consult the experts before using any scale with Bio-Impedance technology. Why does the weight loss stop? Scales body composition analyzers will help to answer this question. Sooner or later, everyone can meet the fact when scales fix the same figures. Unfortunately, for many people, this fact becomes a disappointment. It’s true that people often give up. But, if you use ordinary digital weights, then you will not get an answer. And if these are body analyzers scales to track a weight loss you will understand what is happening. This situation usually happens in 2-4 months after you began to lose weight. If you want to lose weight, check also Perfect Portions digital food scales. Of course, it depends on your body weight. And either you are just dieting or training as well. You are following the right nutrition and workouts. So the fat is at a very low level. At the same time, muscle mass increases. Accordingly, fat monitor scales will show this information. Thus, you will understand that the efforts are successful. And you are on the right way. When it comes to visceral fat your weight could be even 1-2kg higher. The matter is that this type of fat is difficult to remove. Again, keep calm. The fitness scale that measures body fat will give you this information. So it’s high time to make the right decision and choose the best body analyzer scale to track the weight loss. Meantime you can visit any fitness club or gym. At least once per week, you can use their smart scales to analyze the body composition. Record and monitor as a minimum of four indicators. Namely, weight, fat percentage, level of visceral fat and muscle mass. How to keep the desired weight for a long time? It’s all about diet and habits. If you lose weight with the help of any diet is one thing. Surely, it’s not the best way. And, when you return to your regular eating routine you can gain previous weight again. Sometimes even more kgs could appear. The other situation when weight loss is the result of the proper nutrition program. In this case, your food is balanced in fat, proteins, and carbohydrates. However, it is not a temporary period. But, it’s a new lifestyle. You do not need to refuse many of products. Simply adjust the quantity and quality of food and the ingredients combination. Do not forget to switch to healthy snacks. Have you already make the serious decision to decide to take care of your health? Then you cannot get the target without smart body analyzer scales to track weight loss. Surely, the purchase of a body composition scale will be the first step to success. We presented the best home body fat scales for your consideration. By all means, you can control not only the weight and fat but other vital parameters. We did our best to discover the information about top-rated body composition scales. The main accent of this review is on durability, accuracy, and functionality. All mentioned best health scales are customs oriented. Definitely, you will win the battle with extra weight and become in fit.